I'd debated posting about this, but then today I read this post on the 365 Less Things blog, and figured why not? Take a minute to read it, it's a short post and very VERY good. I'll wait. *whistles* Back? Ok good. It's about control issues. A lot of clutter comes from control. The very idea of keeping things because "I might need it one day!" has everything to do with control. Why has this been on my mind lately? Well I had a bit of a melt down this weekend, and it was all about my control issues. It started with some bad news we received in the family, health related. And we can't do anything at this time. Just wait and see. I'm really, really not good at waiting for anything. I'm horribly impatient. Even less good with lack of control. 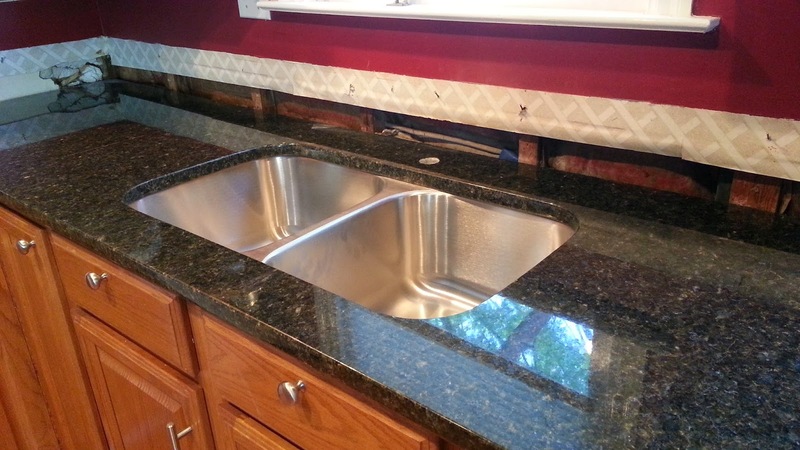 Then, we had our new granite counters put it. Now, I knew they were only doing the counters and it was up to us to re-install the plumbing under the sink and we're also doing our own backsplashes. 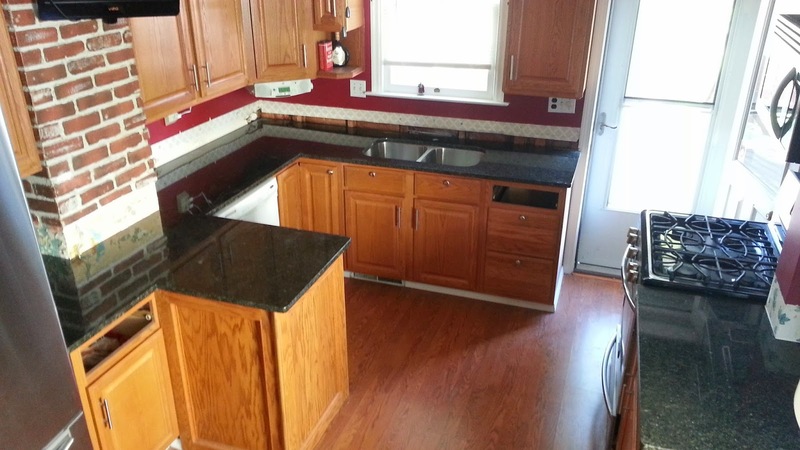 (It was an additional $500 for granite backsplash and I'd rather find some fun tile!) So they came and left and the kitchen was in shambles, aside from the pretty new counters. (They do look amazing. 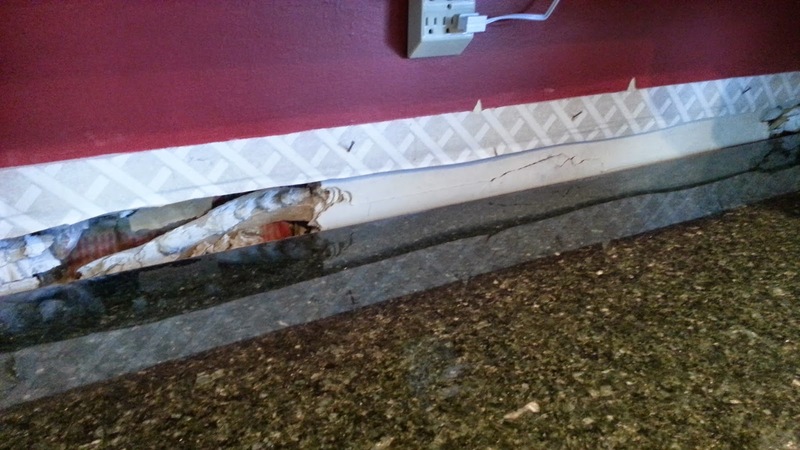 Photos to come) I was unprepared for just how bad it was behind the old backsplash. It's bad. We're going to have to do a LOT of work. More that just some peel and stick tile and seal with caulking. Like...drywall. *sigh* Then, we had a plumbing leak in the basement under the kitchen sink. All my camping stuff was soaked. In the midst of all this, we're trying to perform some shows and running back and forth to the theatre. This was supposed to be my relaxing weekend. With all this, I kinda lost it. All because things were happening that I could not control. This is another facet of myself I know I need to work on now. But at least recognizing that's why I flipped out, was a good first step. And now, since you've read this far allow me to treat you to some photos of my pretty new granite. Thankfully the previous owners left some boxes of the fake bricks downstairs to cover up that part, so no backsplash needed there. Yes, sorry to ruin that illusion, but the brick is fake. And see what I mean about having our work cut out for us? *sigh* BUT, we got a pretty new faucet and as I type a friend is over helping theonlyboyfriend get the sink back together. So we should have a functioning sink today. 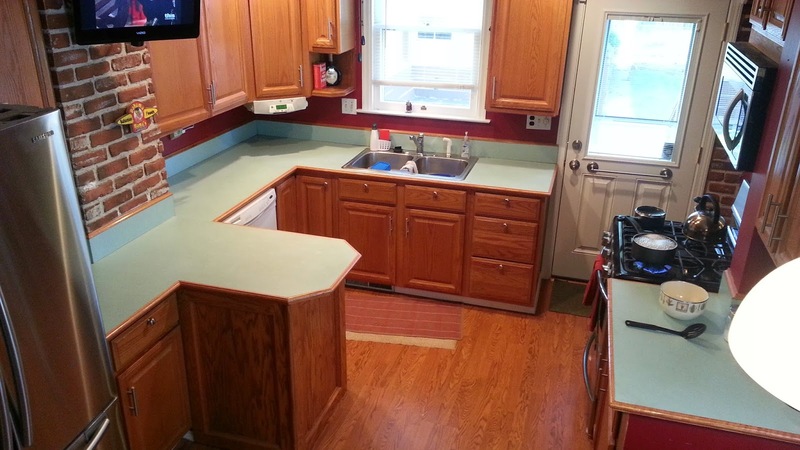 And we have amazing new counters that I love deeply and can only add to the value of the house. Regardless I'm thrilled with the new counters and can't wait to find some pretty tile for a nice backsplash! You can bet I'll post photos when that happens. Although it might be a bit. I hope everyone is having a nice holiday weekend. Do something fun. Take a nap. Drink a drink of your choice. Much love!